A rare exhibition on China’s Emperor Qianlong will be shown at the Acropolis Museum in Athens, with some artifacts being displayed for the first time, from September 15 to February 14, 2019, the museum said on Wednesday. 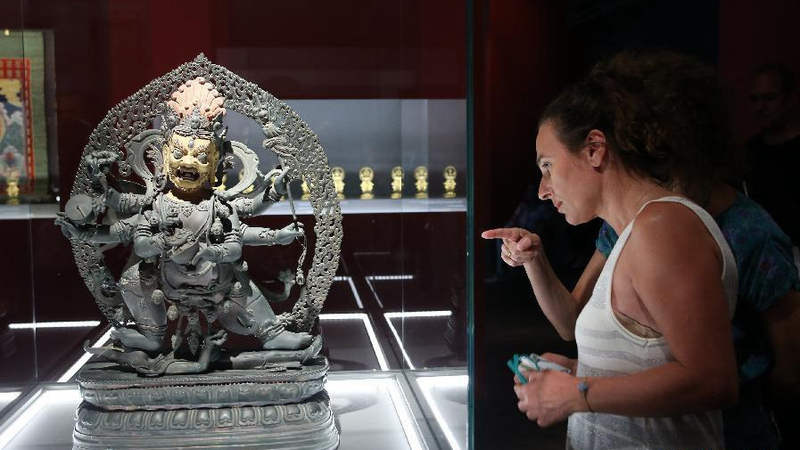 The exhibition, under the title “From the Forbidden City: The imperial apartments of Qianlong,” is organized by the Acropolis Museum in cooperation with the Palace Museum of Beijing. It boasts 154 exquisite works of art, ceremonial robes, furniture and functional objects from the emperor’s private apartments at the Palace of Many Splendors (Chonghua Gong). The exhibition, which includes five sections, recreates the life of the emperor, from his youth as prince to his maturity as the emperor. One of the most renowned emperors in Chinese history, Qianlong of the Qing Dynasty (1644-1911) ruled for over 60 years. “It is a great opportunity to present to the public for the first time locked and dusted rooms of the Great Emperor of China Qianlong which are not open even to the Chinese audience,” the president of the Acropolis Museum Dimitrios Pandermalis said during a press conference. “With these exhibits, we want all visitors, Greek and foreigners, to know the life of the emperor. In the exhibition is mirrored the life of the emperor from his childhood to the years of the accession to the power,” said Li Xiaocheng, deputy director of the Palace Museum in Beijing.